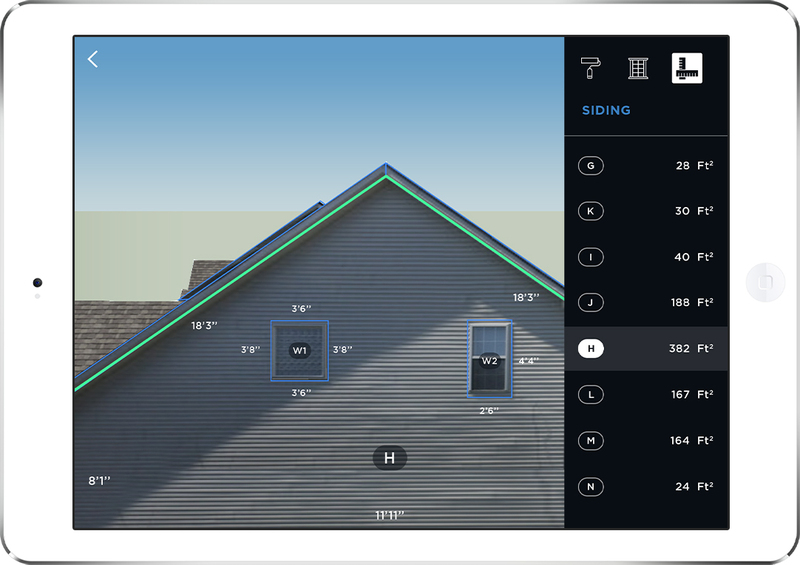 The Hover app uses algorithms modeled on technology in military use, to transform images taken on an iPhone into detailed measurements of every exterior surface below the roof. This May, Doug Amundson, owner of Precise Exteriors, in Hugo, Minn., started using a new app to measure for siding. It’s called Hover and it’s simple enough to use. Amundson walks the house perimeter, taking five to eight pictures with his iPhone. Using algorithms modeled on technology in military use, the Hover app then transforms these images into detailed measurements of every exterior surface below the roof. Hover also produces a 3-D rendering of the façade. What used to take an hour-and-a-half to create now takes Amundson minutes—and that means he has more time to make more sales calls. EagleView uses 3-D models built from aerial photographs. The overhead views can be used to measure roof dimensions and pitch and to inspect a building’s exterior. That service has since grown in sophistication. An EagleView report provides images and a 3-D diagram of the roof and walls, plus measurements (above). Premium reports come with an Accuracy Guarantee. The cost is somewhere between $50 and $100 per roof. “I just used it this morning,” says Jason Kersch, sales manager for Major Homes, in Queens, N.Y. But contractors tend to use the service for complex roofs or not at all, even though prospects seeing an EagleView report are more likely to sign. If competitors can’t be bothered, that’s OK with Kersch, whose says that his use of technology, such as aerial measurement and visualization, help him close business. But it’s the mobile nature of Hover that makes it different. Instead of waiting for a third-party tech firm to generate an image and report, the contractor can decide when he gets to the property if it’s worth it to pay for the service—about $26 per report—and save himself an hour’s worth of measuring. 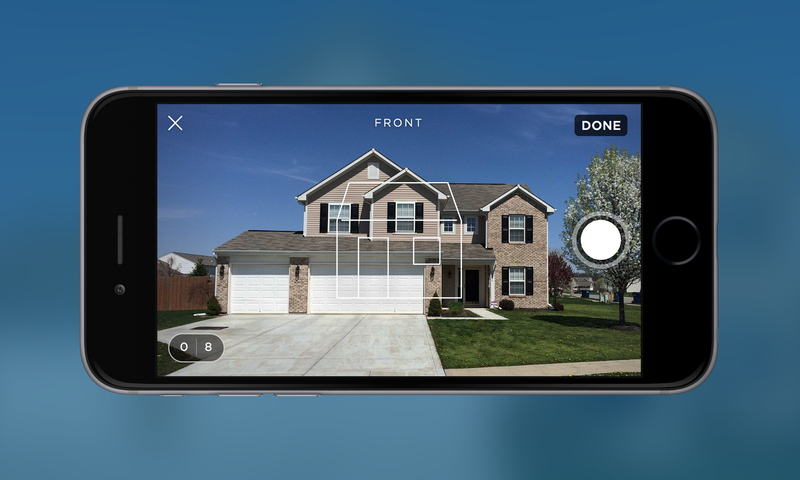 The Hover app calculates dimensions of walls, doors, windows, and other exterior features based on photographs taken with a mobile device’s camera. Built-in tools allow users to preview changes to shape, size, and color of exterior components. Though smartphone camera technology made it possible, the success of Hover’s entry into the home improvement technology arena is yet to be seen. Apps are convenient, yes, but their success depends on contractors actually using them. Fifteen years ago Renoworks, a Canadian company that specializes in visualization software for home improvement projects (and which is currently crafting a partnership with Hover) introduced computer software visualization tools that allow users to change the doors, windows, shutters, siding, and roofing on a house with a mouse click. 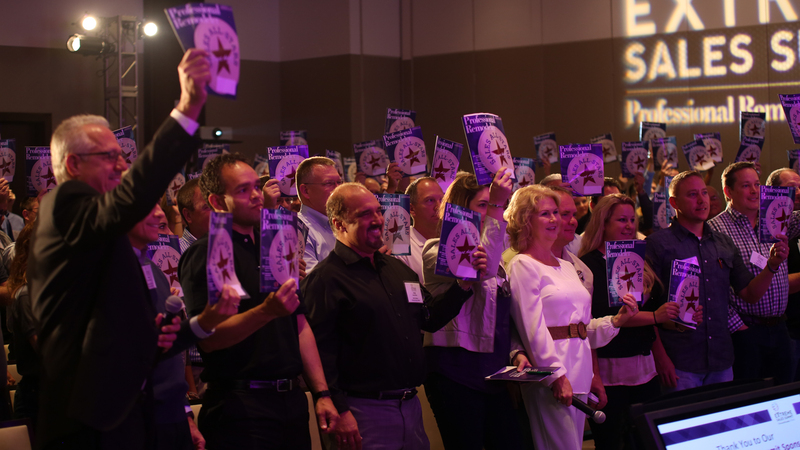 The software is a powerfully persuasive tool when it comes to selling, but company president Doug Vickerson says that its users have, up until now, largely been early adopters. That’s because in the days before widespread use of smartphones, you’d have to bring a laptop to the sales appointment—something many home improvement salespeople weren’t comfortable with. Laptops are clunky, and their use can create moments of nervous silence with prospects, which are poisonous to a sale. But visualization remains persuasive. It provides graphic proof that what the customer wants can be designed and built. A host of manufacturers now offer visualization tools on their websites—Vickerson estimates the number at about 150—but usually for just that company’s products. For example, a tool on the Metal Roofing Alliance website lets visitors choose the type of roofing (standing seam, slate, shingle, etc.) and its color. Homeowners can see what a new roof will look like, and all a salesperson now needs to do is sell his product’s value and its price. What if you’re planning to change the entire façade? One site that puts all that together is Ohio-based distributor Norandex. Contractors or their homeowner customers can access Renoworks technology on the Norandex site, which allows them to select from an assortment of exterior components including roofing, siding, and doors. Norandex spokesman Mike Horgan describes the company as an early adopter. Two months ago, Norandex scheduled a webinar with Hover to train Norandex salespeople on use of the application so that they, in turn, could teach contractors how to use it. Hover obliged by offering a free two-week trial period to contractors who are new to the technology. In the past, Horgan notes, contractors have held back from using visualization technology to sell because of the difficulty of integrating a laptop into the in-home sales process. With Hover and Renoworks collaborating, there may soon be an app that integrates measurement and visualization tools. Both companies are betting that because contractors can carry this technology in their pockets, it will be something that contractors are ready and willing to use. These examples from ProVia show how its Renoworks-based app enables customers to use uploaded photos to visualize the appearance of different material types and colors and configuration of doors, windows, and exterior and interior surfaces. For companies selling large remodeling projects—kitchens, additions, whole-house remodels—the tech landscape is more multifaceted, with an ever-expanding range of new mobile tools to choose from. Selling a full-scale remodel usually involves multiple meetings with the client and, for design/build companies, a design agreement before signing a construction contract. Such companies are looking for technological tools that meet their needs in both customer communication and design. And the number of options already available is staggering, according to Suzie Atkin, an eight-year sales design consultant at Neil Kelly, a design/build remodeler in Oregon. To produce rough drawings, she uses SketchUp (see the SketchUp video tutorial), stores photos using Google Photos, and for sit-down meetings with prospects, her favorite app at the moment is Evernote, which enables users to store notes, photos, links, and documents and to organize them as a presentation in face-to-face meetings. For out-of-town clients, Atkin uses Skype, the telecommunications application software that enables computer-to-computer video calls. But what Atkin does first is send prospects to her Houzz page, where they can view projects she has designed and read reviews. After an initial phone conversation, she also sends a link to her personal website, located within the Neil Kelly site. Houzz has evolved into an indispensable marketing and sales tool for many full-service remodelers. The website’s 35 million monthly unique visitors can dip into design ideas, select from 7 million stored project photos, read guides, solicit advice in discussion groups and, ultimately, pick a contractor to do their job. Many remodelers use BuilderTrend, Co-construct, or other project management systems, Cooper says, mainly to enhance project manager efficiency. In his view, though, it’s also a highly effective sales tool. “If I say I’m going to be out of the house on October 14,” Cooper says, “that’s what I mean.” And he can prove it to clients. BuilderTrend integrates sales, project management, and client relations functions in a single cloud-based application that is available for desktops as well as iOS and Android devices. Kim Hinman was using Chief Architect years before the company released its first mobile app, Room Planner, for the iPad market in 2013 (it works on an iPhone and on Android devices as well). Hinman learned her way around the program by going to seminars and regularly incorporating updates. Today, Room Planner—which allows users to quickly place and arrange rooms, furniture, cabinets, doors, and windows—is often her principal means of selling a project (see “Enhanced Reality”). “We see it as an educational opportunity for homeowners to learn how remodeling works,” Hinman says. The production manager at Spring Creek Design needed some special joist hangers. When the company’s project manager called around, not a single local supplier carried them or could get them in less than a few weeks. That’s when owner Peter Cooper went to online retailer Amazon.com. A day later, the joist hangers were delivered to the jobsite via UPS. “Say we need a case of spray foam. I can send a guy to the building supply place or I can order it from Amazon and it’s on the jobsite the next morning,” Cooper says. If a client can’t decide among three light fixtures, the company will order all three from Amazon, then return the two that aren’t selected. It’s faster than visiting a showroom. Many design/build remodelers and large home improvement companies have digitized their in-home sales process. Technology can not only help you sell, it can also cut the lead time from sale to installation as well. Left: Reborn Cabinets teamed with digital document management company Fluix to create an app that enables a contract digitally signed in the client’s home to be instantly available in the company’s office. The app cut Reborn’s sales-to-production cycle time in half. Two years ago at Reborn Cabinets, in Orange County, Calif., it took about 48 hours from contract signing to move a job into production. Vince Nardo, the company’s CEO, wanted to shrink that cycle time and realized that the only way to do it was to “take away the paper” from the company’s salesforce of 20-plus reps. “We needed to get the information when it happens,” he says. Philadelphia-based writer Jim Cory is a senior contributing editor to Professional Remodeler who specializes in covering the remodeling and home improvement industry. Reach him at coryjim@earthlink.net.